Outfit ideas are like karaoke songs for me. The best ones come to mind when it's not the time or place for them, and when the moment is nigh, I revert to my default look—white jeans and a top (or, in karaoke terms, "Heart of Glass"). All winter long, I sit in my layered coats and dream of new outfits to try once the climate permits. Come spring, I've either forgotten them or don't have the nerve to take them for a spin. I imagine my favourite street style stars are quite the opposite. They're like Kevin Bacon in Footloose: The more you tell them not to dance, they more they'll dance. They commit to brilliantly resisting the mundanity of prescribed cold-weather dressing with Saks Potts coats, polka-dot tights and hiking boots. And spring is just their time to cut loose. Now that the weather is warming up, I'm spending a lot of time scrolling and saving fresh looks to try. Spoiler: I've found so many good ones already. My research has reminded me that the easiest way to pop a refresh into one's wardrobe is to add some colour. Green, yellow, and purple are the top colours I've seen this season (often in pastel shades), but below is an entire rainbow assortment of looks to try. Think of these pieces as a packet of Skittles, but make it fashion. Keep scrolling to the taste the rainbow and dream up new ways to wear colours this spring. 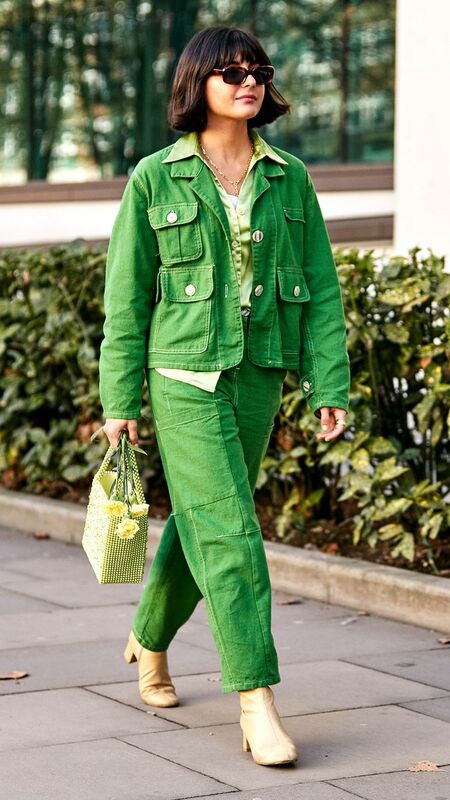 Style Notes: Green on green on green is very much a look that has carried through from last year. I find this much more tempting to try than a glass of green juice, so cheers! Style Notes: Rainbow stripes are a perennial fave for a reason. From knits to bathing suits, try pairing yours with the season's It colour. Style Notes: I'm seeing a lot of brown and green together, which reminds me of my noughties youth. With neon green, though? So refreshing. Style Notes: If you're not ready to commit to a head-to-toe green look, add black and white for balance. Style Notes: Pernille somehow makes ombré neon green look minimal. A major feat. The beige is what does it, though. Style Notes: I've never thought of this colour combo in my entire life, and I'm here for it. This ASOS skirt is a cult fave for this reason: It goes with everything. Style Notes: Pairing paler tones of the season's It colours is an easier way to introduce them to more minimal wardrobes. Style Notes: This pleated dress really speaks for itself, but adding the white heels and brown bag makes it a whole new look. Style Notes: Wearing head-to-toe yellow is one way to summon the sun. I love how Ellie breaks up her monochromatic look with a metallic accessory. Style Notes: These primary colours paired together show us why they deserve their distinguished title. Simply fabulous. Style Notes: Leopard print really is neutral and will help round out any look, from minimal to maxed-out yellow. Style Notes: Pale yellow is a street style favourite this season, especially with lilac-toned purple. Style Notes: Wearing a bold colour as suit is a great way to go bold for spring. It really doesn't need much else. Style Notes: Emili is a modern-day Carrie Bradshaw in that she pushes the boundary of every outfit, and we often copy her quickly afterwards. This colour combo is a must. Style Notes: If you're trying head-to-toe of any colour, white accessories help frame the look. Style Notes: I wasn't joking about pale yellow and purple. Three's a trend, people! Style Notes: Navy is somewhat of a dark horse this season. Though seen as a classic it is popping up in fun new ways. Shout-out these cowboy boots! Style Notes: You can tell Bianca is feeling this colour combo. It's equal parts sophistication and fun. The snake print makes it feel very on trend. Style Notes: Take a monochromatic look up a notch but getting it in a fun print. Checks or polka dots are a great place to start. Style Notes: Introducing colour into your look this season? Start slowly by swapping out a piece from an all-black ensemble and keep the rest the same. Style Notes: Ada has been wearing this trench on repeat, which has pushed her to try new colour combos like this one. The two strong textures make the whole look that much richer. Style Notes: Grece can do no wrong, it's true. These three colours together just feel so right. Style Notes: As always, Tiffany Hsu balances her outfit with such ease. Here, her white accessories complement her head-to-toe red perfectly. Style Notes: Like Grece, Hannah turns a traditionally "wrong" colour combo (pink and red) on its head by not only pairing them together but adding a third colour. Style Notes: Karina is bursting with good vibrations in these rich hues. Skip the vitamin C and copy this for an energy boost. Style Notes: Like a cherry blossom, this outfit ties together beautifully with the varying tones of creams, whites and pinks. Style Notes: Follow Anne for a constant in-feed lesson on colour combos. Because head-to-toe fuchsia wasn't far enough, she added a green bag.